My Community Garden has also been taken care of in good time this year. In order to make better use of this piece of land I have made a concerted effort to address the tasks in this plot early on. I paid my renewal fee, turned the soil in the back section and planted in the sweet peas and the fava beans. The favas will stay in the garden until summer and I will harvest them and the garlic, which is already up and growing, punching through the leaf mulch, at about the same time. 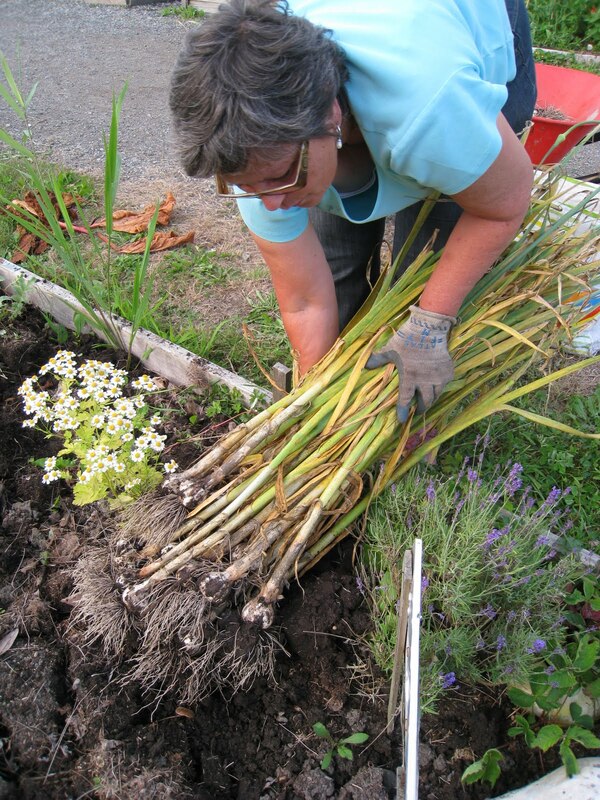 Somehow I had the foresight in fall of 2012, when I was prepping the bed for planting the garlic, to dig a trench around the perimeter of the box and I heaped the soil onto the middle of the bed. Into this raised bed I planted the cloves of garlic in the front section of the bed. Just as well that I did that because we have had so much rain that the garlic would have been sitting in water and could have rotted. Another important resource, other than worms, that I bought at Seedy Saturday was three bags of composted horse manure which I will apply to my beds along with the compost I have been making at home when I am ready to plant my summer crops. Check out this beautiful honey that was gifted to me. Brian, the bee keeper on the farm was cleaning up the hives in readiness for a new season. He was quite despondant because of all the bees that died over winter. I promised him we would make an effort to consider the bees this year and plant more flowers that would provide them with nectar. Brian gave me this beautiful piece of honey comb dripping with honey. I promised him I would take a piece to share with the volunteers. I popped a piece in my mouth ... honey comb and all and savoured the intense flavour of this most amazing food made by bees. I have now emptied my compost bins, harvesting the compost by moving it out of the bin and into a bucket with holes in the bottom so it can complete it breakdown and drain off the remaining moisture. I have removed the worms I could find in the finished compost and relocated them in a bin with more organic food waste for them to feed on and break down. I also bought more "red wrigglers" at yesterday's Seedy Saturday and added them to the new compost bins. Lots of worm power working for me! Bunches of Sweet Peas have become a yearly Sharing Farm fundraising project since 2008. The work begins in early spring with drama of keeping the hungry mice at bay when we plant trays upon trays of sweet pea seed. 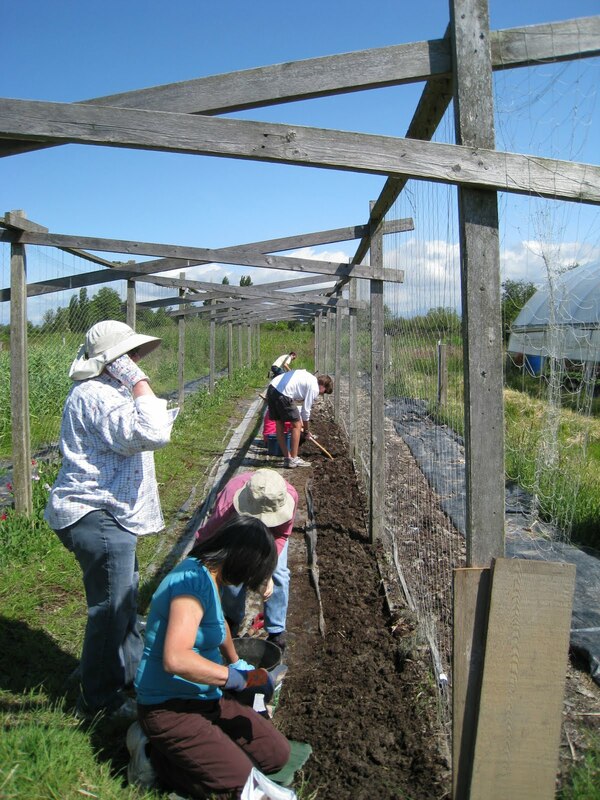 As the soil dries out the ground is prepared with carefully weeding, tilling and fertilizing and planting up hundreds of seedlings along the trellis, then keeping the hungry slugs away. 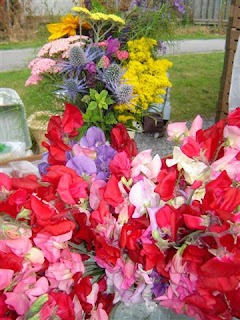 Finally, by mid July, the fragrance and brilliance of the sweet pea blooms climb the trellis, to please the eye and tantalize the nose. 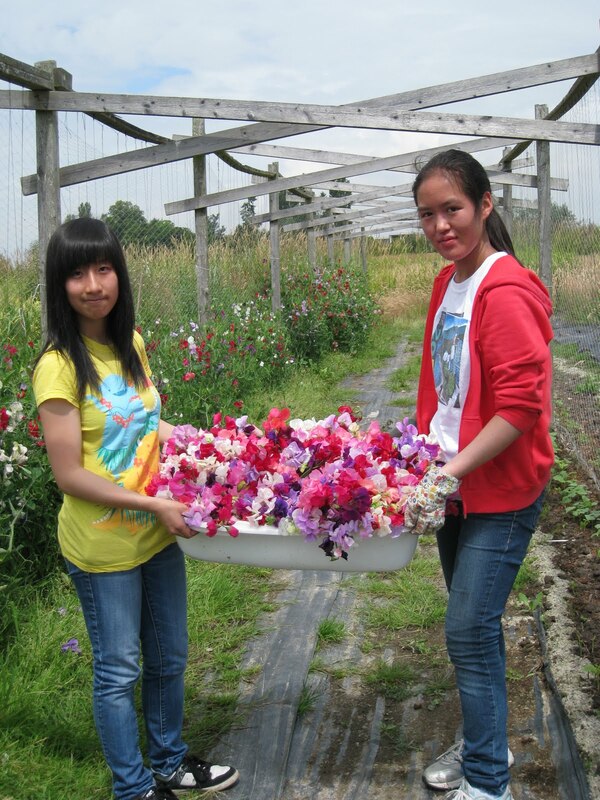 In previous years, the bunches were sold through the Steveston Farmers’ Market, by the Farming Students. This year the Farm has not taken a booth at the market so we had a situation on our hands. Beautiful sweet peas, but no where to outlet them and our Fundraising opportunity at risk. 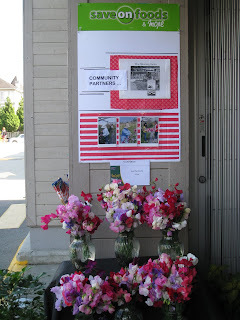 This was the topic of conversation one day, among the volunteers and the idea came up to approach our neighbourhood supermarket, Save On Foods, to see if they would care to partner with the Sharing Farm to sell the beautiful bunches. They were approached on Friday and by Monday the bunches were displayed at the entrance; before the display was even up three bunches were sold. 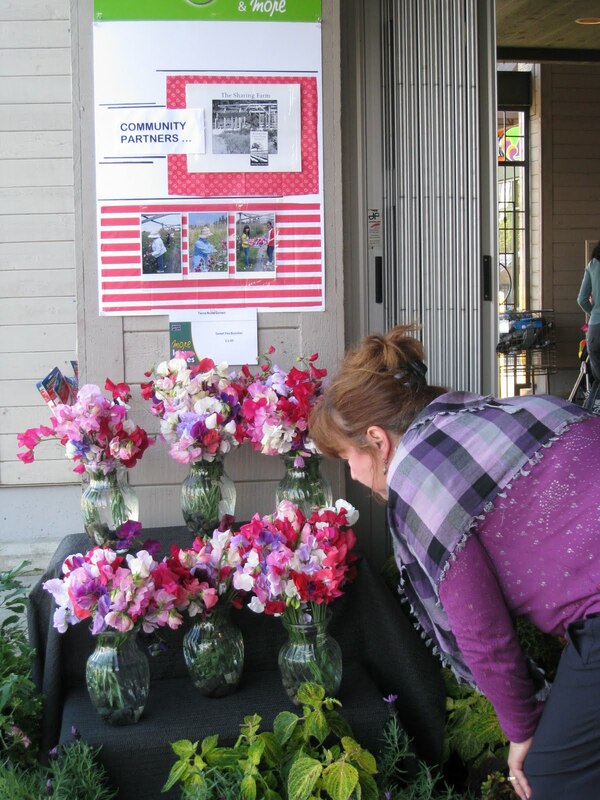 So do look out for our sweet pea display and support the work the Sharing Farm does in our community by taking home an inspiring bunch of sweet peas flowers. This spring I faced the challenge of planting up a large quantity of patchoy seed ... fits the 'small as a grain of mustard seed' analogy. When you are planting trays which consist of 100 cells per tray hence the dilemma. So I hit upon a little technique using a bamboo skewers ... still takes patience ... but works quite well. Not even necessary to dampen and flick the skewer with each new seed. See if you find it useful. In mid July, I finally harvested the garlic I had grown in my commumity plot. The garlic had been planted in October. Nine months, folks, to create a head of garlic from one clove ... Appreciate it ... as longs as it takes to gestate a baby! Now the garlic was harvested, the next task was to hang it to dry. Somewhere dark, cool, and out of the rain. I decided that under the front staircase fit the bill. 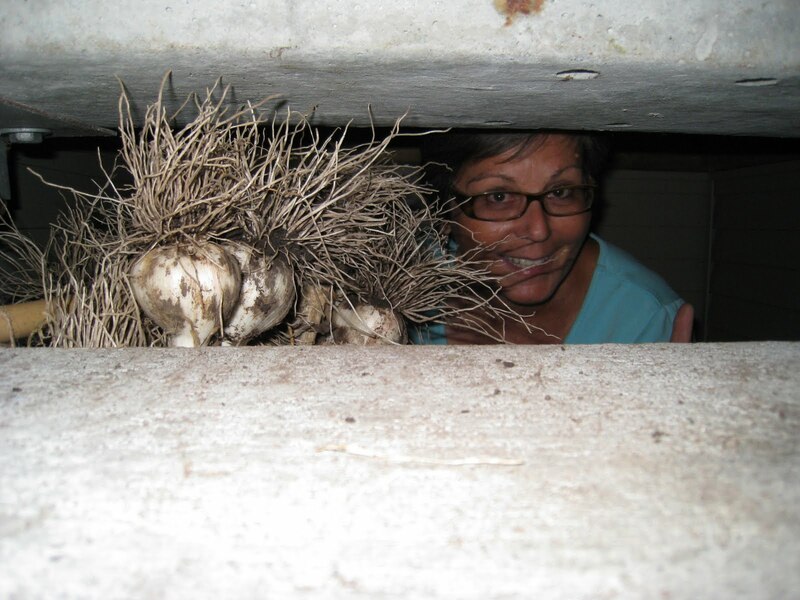 Getting out from under the stairs after hanging the garlic was not quite so easy. 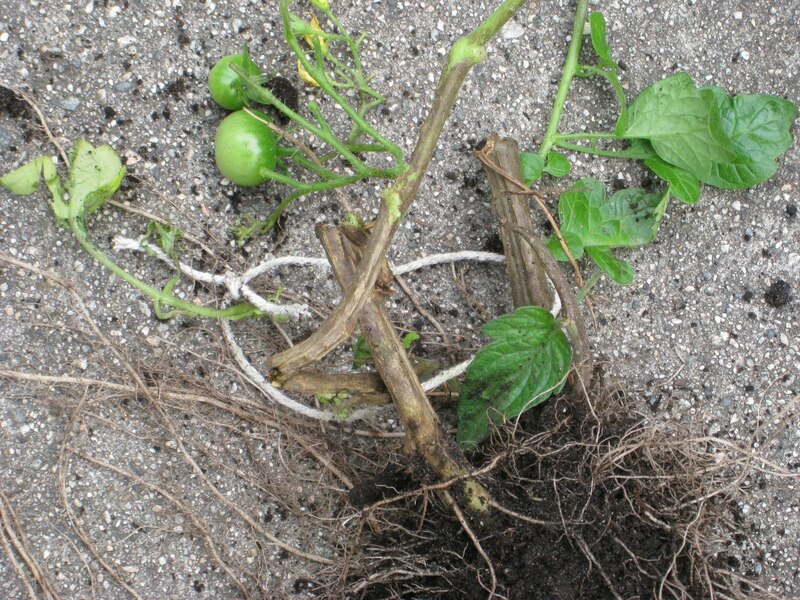 I came across a plant showing the classic signs of "THE BLIGHT" ... stems turning black infiltrated by the disease moving along the healthy green stems. 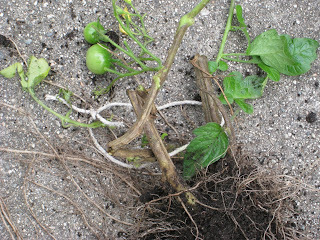 So I ripped the entire plant from the ground and threw it out. 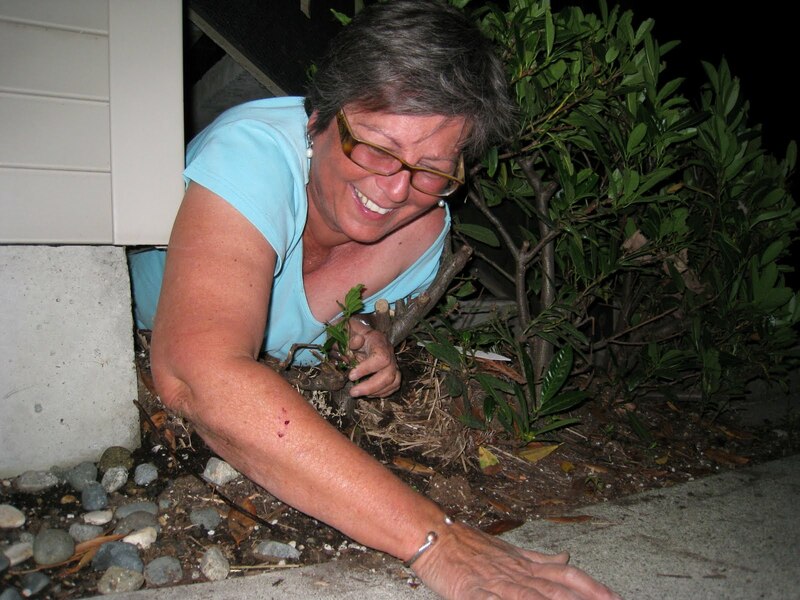 We had cleaned up all cuttings and the infected plant and threw it all into the trash rather than the compost so as not to spread the infection, when we hear this fury coming towards us. Unfortunately, it was not one of Miguel's plants I had pulled out, it belonged to another resident who shared the box with Miguel. She was coming towards us at full sail, bellowing like a bull and shaking with indignation. I had ripped out her tomato plant with the little cherry tomatoes on it that she had been nurturing so tenderly and awaited with great anticipation. Well, Dorothy jumped into the fray and the two went at it in Chinese and with me humbly apologizing, empathizing and explaining in turn, to no avail. It took half an hour for her fury to abate enough before she could accept what had happened. I had to pull the garbage bag out of the dumpster and find her plant ... the one with the cheery tomatoes and show here the black stems before I saw a glimmer of understanding in her face. It will probably take longer for to actually forgive me. I learnt a powerful lesson ... come between a gardener and her treasured tomato plant at your own peril! Balcony Gardening: At present I am experimenting with growing as much of possible on my balcony garden. I am keeping a blog in case it is useful to anyone else. 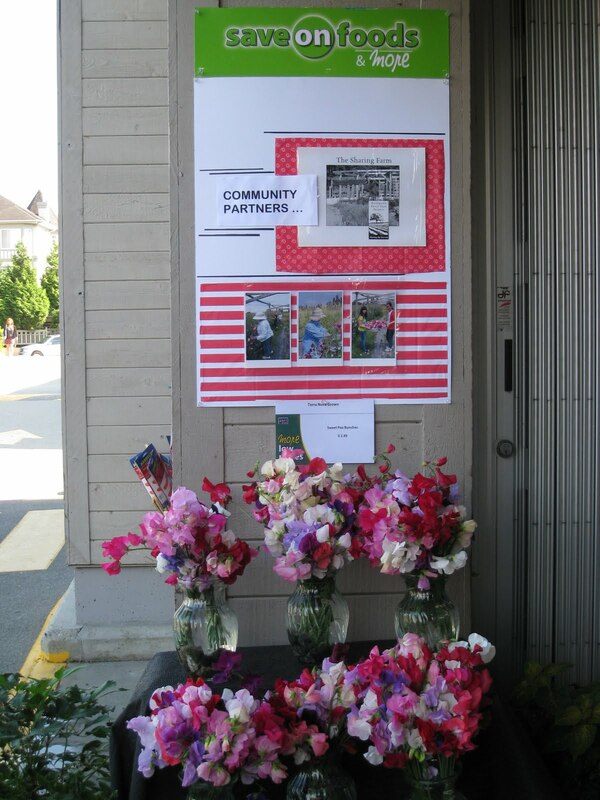 Richmond Urban Farms: This is a collaboration between Arzeena, Luc and Susan. 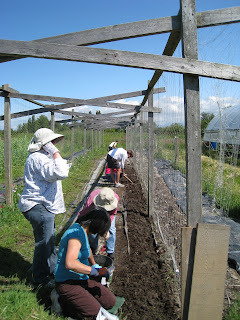 We are growing food using organic methods in other people's back yards. We would like to share our experiences incase it is useful to anyone else.